Running may have saved my life! At the age of 50 out of the blue I had a stroke which in no part was due to my sedentary lifestyle. Luckily there was no permanent physical damage but I had to learn to walk again step by step due to the part of the brain that was affected. When I left hospital I was told if I did not take up some form of exercise I would have another stroke within 12 months that could kill me. So with 6 months off work I was signed up by the hospital to a gym especially for people who were recovering from a stroke & then after that I started walking then jogging then the odd day running & the rest is history. After joining a running club which was Bitton road runners, who would of thought I would end up doing 2 marathons including London within 5 years & now after suffering a recent Achilles injury I am just starting back enjoying my running & cycling again together with Kerrie Reed. Who along with the running club encouraged me to train hard & keep going even through the bad times by sticking to our training plan. After first meeting up during club runs we still stick together & meet up to do all our runs despite her traumatic accident in 2015 & we both completed the Westonbirt 10K together. We are both building ourselves back up & who knows what the next 5 years will bring. Triathlon, Ultra-marathon ?? If you don’t try it you will never know. 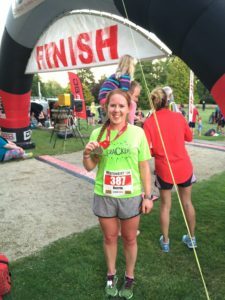 2o14 was a fantastic running year for me – racing once a month and getting personal bests from 5k to half marathon so I decided to train for a marathon. I trained hard and completed Manchester marathon. 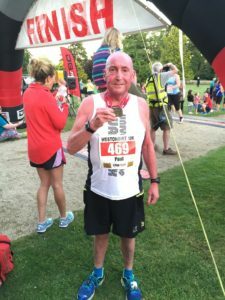 I was struck down with Glandular Fever (GF) during marathon training but so pleased looking back I carried on to complete the marathon at limited capacity. To add to the GF in 2o15 I was out running at reduced capacity as I was still recovering from GF when a ‘Blackthorn’ penetrated into the top of my foot all the way through, a week later I was omitted to hospital and ended up with sepsis (blood poisoning) which almost ended my life and could of lost me my right foot. Doctors said that my fitness levels through running at this time actually saved my life! When I was able to walk again without pain I started with a minute run and a minute walk increasing each week my running time by a minute and now I am very happy to report I am now back to 10K 😉 it’s been the hardest thing I have ever done but I’m not one for giving up and I am determined to get back to where I was (in good time) and once fully recovered from both illnesses ;). I know I have a long way to go but the fun and good memories i have from before the illnesses keeps me motivated to keep running and the fact that running saved my life! I’d like to say a Special thanks to my good friend and training partner Paul Westaway for joining me on my return – he’s been a rock!